I actually have a ton of favorite pancake memories! One of my favorites though is when I took my son Ryan to get my car washed. While we waited for our car to be cleaned we walked next door to IHOP. We sat across from each other in a booth and shared a short stack of pancakes. Extra butter. Extra syrup. I took pictures of him enjoying each bit and the many faces he showed are burned into my brain. Props to anyone who can scoll way back into my IG feed and find that post for me! Pancakes are more than just pancakes. They are fluffy, buttery memories stacked high. And whenever I have a hankering to reminisce, I dive into a warm pancake and relive some of the happiest moments of my life. With my daughter Mila pancakes still reign supreme. Though in true Mila fashion she loves them topped with powder sugar. When I make pancakes Mila likes to sit on the counter and listen to Thriller by Michael Jackson or Let It Go from the Frozen soundtrack. We talk about Disneyland or how mangos are her favorite fruit but for some reason she only eats them frozen. We laugh together and I tell her I love her more than a few times, to which she always answers "Too mama! Too!" When the pancakes are sizzling on the griddle a sense of togetherness wafts in and it feels like I have both my kids with me for a split second. Food does that to me some times. As do songs, places and other certain things. I savor those seconds of time when I have Ryan and Mila in one space. 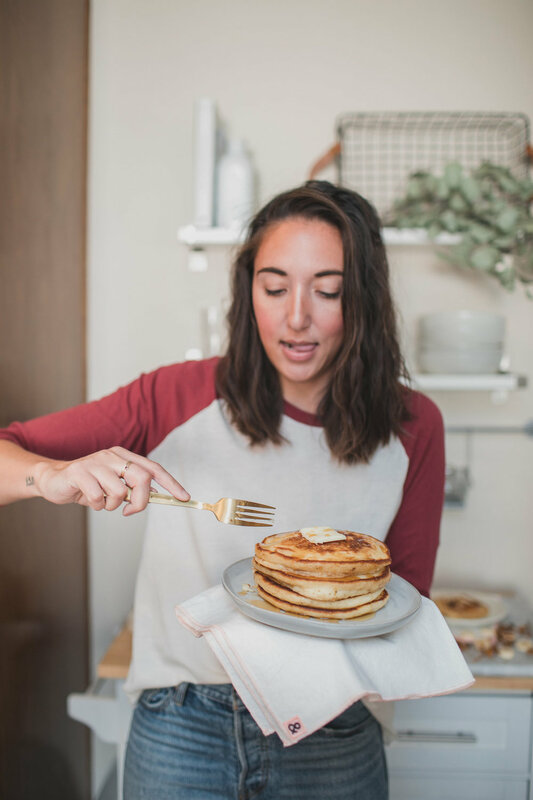 A few weeks ago I asked my friends on Instagram and Facebook if they has any specific recipe requests and pancakes was at the top of the list. Now, I have a pancake recipe already on my blog here which still stands as a go-to for us. But I've put together a few new ways for you guys! My hope is that you make it a family affair. Make pancakes into memories! It might sound silly to some, but I promise it will be the most fun and tastiest way to create life long memories with your children! Also, if you have extra pancake batter but everyone is full … make the rest of your pancake batter! Then freeze the extra pancakes. You can reheat them in the microwave or toaster oven for a quick breakfast or lunch time snack. about 3 more tablespoons of butter to use in the pan while cooking pancakes. **You'll want to add a bit of butter to the pan in between cooking every pancake! 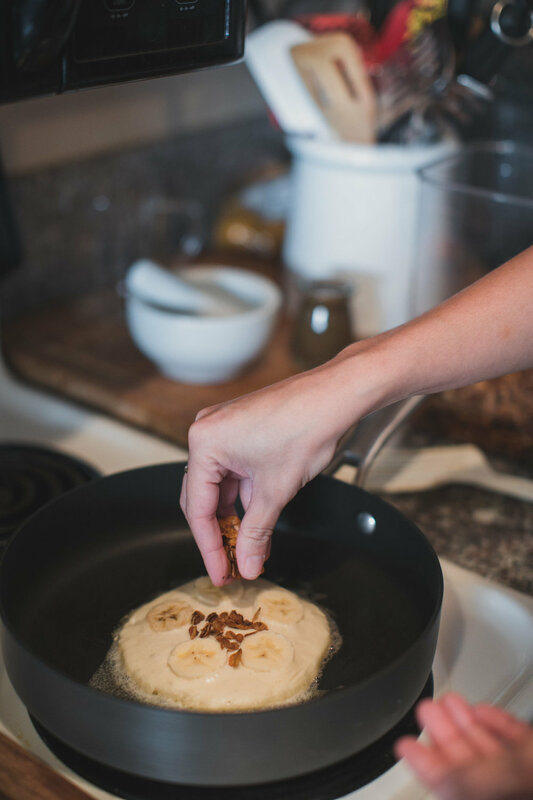 Add 2-3 sliced bananas and 2 cups of granola to your ingredient list if you are making Banana Pancakes. *You can use whatever kind of granola you'd like. *Feel free to use whatever kind of milk you enjoy and swap the all-purpose flour for Gluten Free Flour or Almond Flour. *If you have extra pancake batter but everyone is full … make the rest of your pancake batter! Then freeze the extra pancakes. You can reheat them in the microwave or toaster oven for a quick breakfast or lunch time snack. In a large bowl sift together the flour, baking powder, salt and sugar. Then with a whisk mix in your milk, eggs and vanilla. Lastly, melt your 3 tablespoons of vanilla and whisk that into your pancake batter. 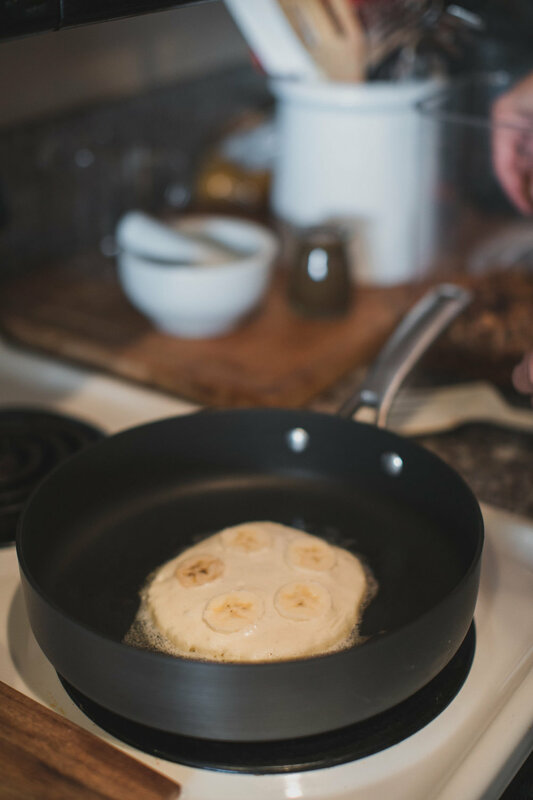 If you are making the Banana pancakes be sure to prep sliced banana and granola before cooking pancakes. If you are making the Berry Spinach pancakes be sure to blend together the blueberries, spinach and coconut water in a blender until smooth. Then set aside. In a large skillet or griddle pan on medium low heat melt a bit of butter. Use 1/4 measuring cup to pour your pancake batter onto the pan. 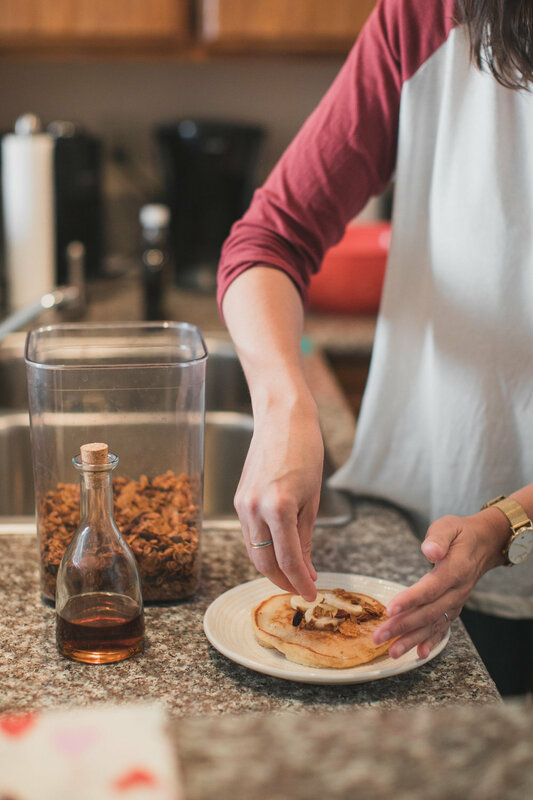 Skip these steps if you are making regular pancakes. 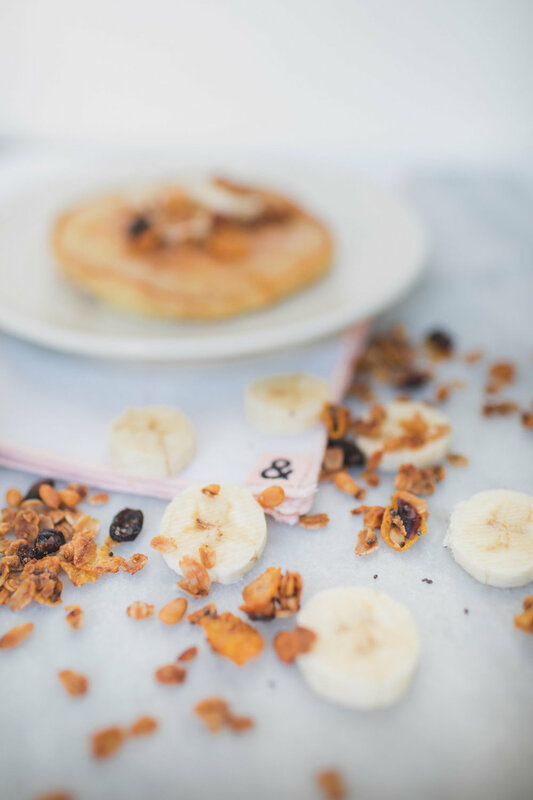 Add a few slices bananas and sprinkle granola onto the pancake right away. 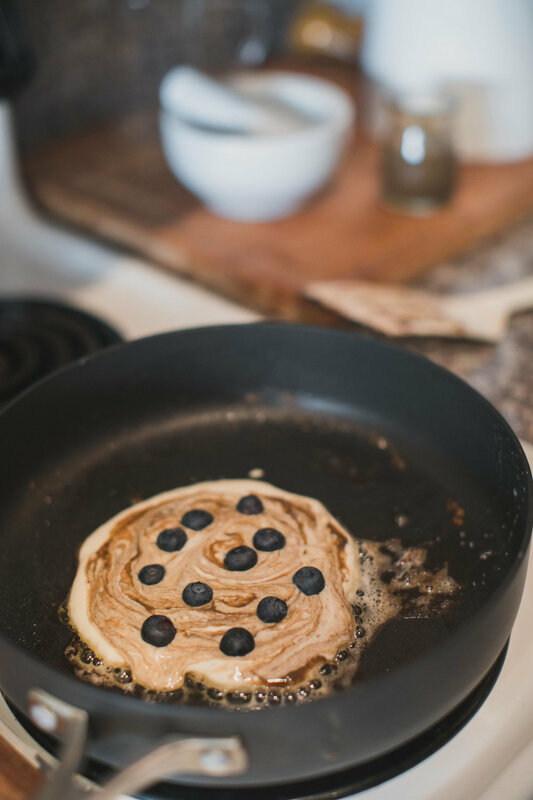 Drizzle the blueberry and spinach puree on to the pancake right away. Use a butter knife to swirl into the pancake batter. Add a few blueberries to the pancake. Once the pancake batter starts to bubble it is time to flip. After you flip your pancake add a bit of butter of to the top and let it melt into the pancake. After about 1 minute your pancake should be done. It is important to keep the heat on medium low so it cooks the pancake slowly from the inside out. If your pan is too hot then the outside gets cooked but the inside will be raw. If you gently push the pancake and it bounces back then it should be fully cooked. Add more butter to the pan and repeat the process until all your pancakes are made. Be sure to add butter in between making every pancake.